The above info came from fractyl2, and was edited by yours truly (contact me). The image came from Anime X-press. Ten years after the adventures of Yugi and his friends, Duel Monsters had become so popular, that education areas like Duel Academia High were established. Yuki was on his way there for a entry exam when he encountered the legendary duelist Yugi Moto, who gave Yuki a special card with the knowledge that the boy was no mere duelist. Yu-Gi-Oh GX is a series that takes place after the Yu-Gi-Oh Duel Monsters series. 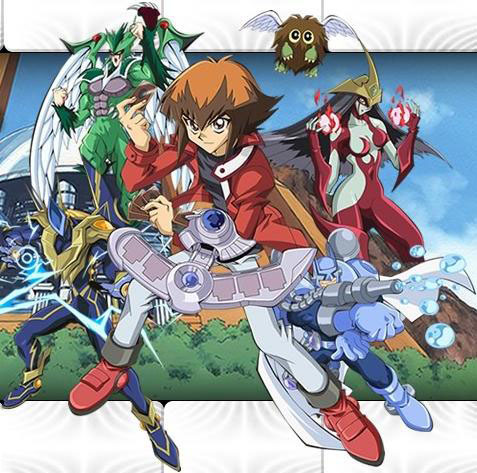 This series is a boy named Yuki Judai who attends in the Duel Academy a school which students learn the basics of dueling and learn how to become great duelists. Yuki will face many challengers in the Duel Academy and hopes to become the next Duel King.